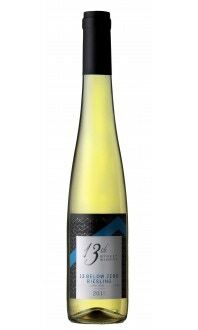 Tasting Notes: This fully dry Riesling has a fruity aroma with peach and floral notes plus hints of mineral and subtle spice. Dry with medium plus acidity and lovely freshness, it is medium-bodied with great length. Will certainly reward medium-term cellaring with added complexity and softer acid. With food, take advantage of the vibrant acidity and serve it alongside dishes with high acidity to match or with richer dishes as a refreshing counterpoint. Salads, fish, shellfish, fatty pork, smoked foods or fresh tangy cheeses will all fare well here. Winemaking Notes: This Riesling was hand-picked in late October entirely from the old vines at the 13th Street Vineyard, planted in the late 1970s and early 1980s. After manual sorting to select only exceptionally sound and ripe fruit, whole bunches were pressed slowly after some skin contact in the press. The juice was moved to stainless steel tanks where fermentation took place. Once fermentation was complete, the wines were moved to temperature controlled steel tanks where they remained on the fine lees in order to develop additional weight and richness. They were kept at cool temperatures, in order to prevent malolactic fermentation, for several months during which time they were racked periodically. The wine was bottled in May 2016. Appearance: Bright. Clear, straw-coloured core with lighter rim. Nose: Medium aromatic intensity. Nectarine, green apple, lemon and lime citrus, saline, lanolin, a touch of honey. Palate: Medium- body, medium+ acid. Green apple, lemon. Minerality. Quality: A good quality Riesling. Very front-forward with acidity pleasantly leading the way. Food Pairing: Shrimp ceviche, sushi like sashimi and maki, crab cakes, steamed mussels with white wine and garlic, grilled black cod with fruit salsa, and steamed pork belly bao buns.